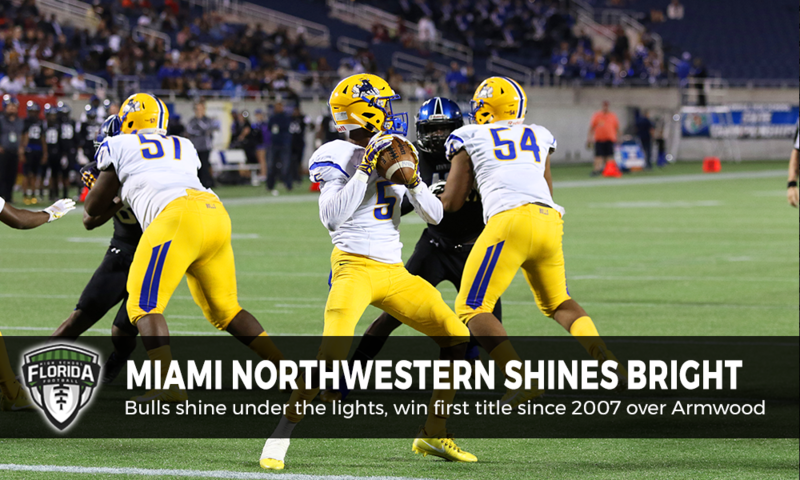 ORLANDO, Fla. — It had been ten long years since Miami Northwestern won in Orlando. The last time the Bulls could put another ‘State Champion’ patch on their varsity jackets was all the way back in 2007, when they beat Boone (Orlando) 41-0 in one of the most dominating state title wins in history. Northwestern hadn’t been back to the Citrus Bowl since a close loss to Seminole in 2008. A decade of frustration was doled out on Armwood (Seffner) Friday night as the Bulls won a hard-fought game against the Hawks and captured their fifth overall state championship. The game itself was the best of the weekend so far, featuring stellar quarterback play and dominating defense throughout. Armwood and Northwestern both came ready to play on defense, forcing punts on each team’s opening drive. After the Bulls were forced to punt again on their second drive, a bad snap went out of the end zone, which would put Armwood up 2-0. The Hawks would start in great position after the kickoff due to the safety, and after a short two-minute drive, Devin Black tossed his 26th touchdown pass of the season to Oregon-commit Warren Thompson, putting the Hawks up 9-0. Northwestern was still having a hard time getting anything going on offense, and ended the first quarter with -25 yards rushing. They needed a spark, but for most of the 2nd quarter, Armwood remained in control. Then, once again, special teams came into play, as Armwood punter Ricardo Watson fumbled the snap, and Northwestern forced a safety. On the ensuing kickoff, Northwestern kick returner Karyn Davis ran over an Armwood defender, which seemed to swing all the momentum in favor of Northwestern. Three plays later, Devonne Kendrick strolled into the end zone after great blocking by his offensive line, and the Bulls tied things up at nine. At the half, although Armwood didn’t have the total yards that Northwestern did, they were still in the game due to stellar defensive play from Allah Whitacker and Watson, each of whom had multiple tackles for loss. The game would hang on who could get their passing game going in the second half. Black did have the earlier touchdown pass, but had only thrown for 34 yards total. Northwestern quarterback Chatarius Atwell had been out-dueling Black with 92 yards passing with a 66% completion rate. Northwestern had also been keeping Armwood running back and Ohio State-commit Brian Snead in check, who came into Friday with 1,329 rushing yards. Thankfully for Northwestern, Atwell came out and stepped things up, taking a QB sweep 52 yards for a touchdown late in the third quarter. The Bulls were now up 15-9 with momentum on their side. After forcing another Armwood punt, Atwell found Davis on a play-action pass wide open over the middle for a touchdown. It put the Bulls up 24-9 to end the third, and things looked bleak for the Hawks. Armwood got the ball to start the fourth, and while Black did all he could to lead the Hawks down the field, the Northwestern defensive line seemed to be in his face every play. The Hawks turned things over on downs, and needed a stop just to stay in the game. The defense came through, and Armwood got another chance to get back in the game. All the pressure was on the Hawks offense, and for the first time since early on in the game, they put together a solid drive. It was the Devin Black show all throughout, rushing for 29 yards and breaking several tackles on the way to the end zone to make the score 21-16 with only 6:46 left. Once again, the Hawks needed a stop, and MLB James Miller stepped up.The senior led the charge of defenders breaking through the normally stout Northwestern offensive line, and recorded several of his 18 total tackles on the day. Armwood was able to halt the Bulls and fourth and one, and had the offense had a chance to score the game-winning touchdown with 1:50 left to play. Heroic comebacks are the norm in movies, but the Northwestern defense wanted no part of that comeback story Friday. They forced Armwood into a 4th and 6 at their own 43, and with the game on the line, Northwestern DL Calijah Kancey forced a bad throw by Black and Armwood turned it over on downs, sealing the win for Miami Northwestern. Edwards also sang the praises of senior quarterback and four-year starter Chatarius Atwell, who was dealing with an ankle injury, after the game. The stands began to party like it was 2007 all over again, and the players celebrated all over the field. All of Bulls nation certainly did show up, and despite a valiant performance by Armwood and quarterback Devin Black, it was not enough to overcome the full force of Miami Northwestern.